The vertebrate cardiovascular system includes a heart, which is a muscular pump that contracts to propel blood out to the body through arteries, and a series of blood vessels. The upper chamber of the heart, the atrium (pl. atria), is where the blood enters the heart. Passing through a valve, blood enters the lower chamber, the ventricle. 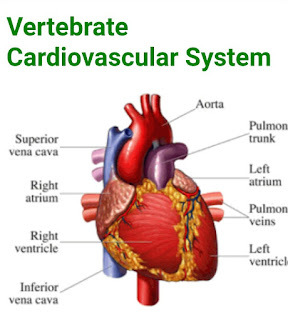 Contraction of the ventricle forces blood from the heart through an artery. The heart muscle is composed of cardiac muscle cells.